Every now and again, I got dressed for work or a wedding or whatever, look at myself at the mirror and says, to no one in particular, wouldn’t it be nice to try and style my hair a different way? We’ve all been there at some point in our lives. Whether it’s with our own looks, the way your kitchen is arranged or with how your phone’s home screen is styled, we’ve all had a moment where that makeover itch is waiting to be scratched and it’s no less true for web developers. When it comes to redesigning a website, sometimes the underlying reason isn’t purely about looks, it’s also about functionality. The realm of the worldwide web, just like every piece of technology in existence, progresses fairly rapidly. Take a look at how much Facebook has changed for example or compare the difference between the website of every American presidential candidate since 1996 for a more pronounced difference. That is not to say that aesthetics doesn’t matter in a website redesign. Aesthetics or to use the cooler name, design language, is one of the core tenets of your brand identity. There are times when your company has tilted enough from its original purpose that a reformed identity would be needed, which means that it’s time for a redesign. Other times, it might simply because your design language hasn’t aged well, and a redesign is necessary to keep up with your competitors. In the end, it doesn’t really matter what your reasoning is as long as it’s a good one. A redesign shouldn’t be approached haphazardly, even if it’s a minor one. When done wrong, the backlash, as has been proved by what happened to Snapchat earlier this year, could be detrimental. Both the planning and execution has to be done correctly in order to not mess with the user experience while still achieving your specific business goals. Before you begin the makeover process, the first step you’ll have to take is outline what you would like to achieve from this redesign. These goals should always be concrete and not vague, ambiguous goals, such as because you’re bored of the current look. If it’s related to a new functionality, ask yourself if it’s important enough to warrant a redesign or if it’s something that could be added to the current design. A redesign doesn’t always have to start from zero. You have to determine which part of your website works the way it was intended to and which is falling short. Keeping some of the old parts intact might save you both time and money once the actual work has started. This is the stage where you, as the business owner, need to determine whether this redesign is actually needed or not. Don’t forget to set an acceptable timeline for this process. Once you’ve outline your own goals, the next step is to cross-reference your own goals with what your users want. They’re the ones who’ll be spending time in your website and if it turns out that what they want is in conflict with what you want, it might be a good time to reconsider your own position. This doesn’t mean that you should always take their word over your own, because actually, the customer isn’t always right. People have a tendency to resist changes, even if those changes are actually in their benefit and even necessary in some cases. Apple’s idea of selling one song at a time when iTunes was first launched was unpopular within the industry but it proved to be a hit and managed to drive established businesses like Tower Records to bankruptcy. If you have the necessary data to backup your views over the customer’s, it might be worth it to stick to your guns. 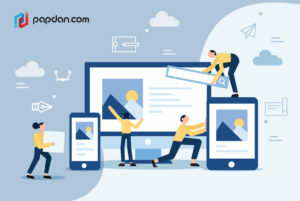 Once you have an idea on how your website is going to look, the next step is to design the layout of the pages in that website and how they connect to each other. You do this by using the concept of information architecture that maps the hierarchy of every page in your website and how they interact with each other. Think of these as the foundation for your website, something you have to take care of first before you could paint and decorate them. Whenever you go on a first date, a great first impression is the number one thing you’re striving for. Every subsequent interaction will always be informed by what you think of your partner in those first few moments. Transplanting that idea into the world of web development, that first impression is the kind of burden your homepage is going to carry. As such, always stress the importance of your homepage in your redesign. Before you put pen to paper, do a simple prototype of all of the ideas you’ve accrued in the first 3 steps to see how they would work in real life. Great ideas don’t always translate well into the real world and it’s common for those ideas to require some fine tuning before they can be unleashed to the public. While it is possible for you to perform some on-the-fly changes to a website once it’s live, this is not advisable. Always make sure your product is fully prepped before they’re out. Once you have your prototype and running, you can evaluate for yourself whether the design you’ve created works the way it was intended to. If you’re completely satisfied, you can proceed with the actual development according to the timeline you’ve set. If it doesn’t, which is more likely, then you could go back to any of the previous steps to figure out things that could be improved. Feel free to take your time with the redesign; it’s too important of a task to rush through. This entry was posted in Article and tagged agency, business, content, design, developer, development, google, marketing, Melbourne web designer, online, search engine, search engine optimisation, search engine optimization, SEO, SEO agency, seo services, social media, technique, tips, user interface, web design, web designer, web developer, web developer agency, web development, website, website designer, website development on August 3, 2018 by Mario.